When their five year old son Jakob was diagnosed with Type 1 diabetes, he had to start using an insulin pump. To show their support, his parents Philippe Aumond and Camille Boivin both got insulin pump tattoos. “We shopped around to find a good tattoo artist because we wanted this pump to be really representative of the real thing — we didn’t want just to have a patch of black ink on us,” Boivin said. “We found this guy, and he is a great tattoo artist, so he did those pumps for us and they look great, and Jacob was really thrilled when he saw that. It turns out that real-life scientists are trying to make the idea of a medical device tattoo into a working reality. 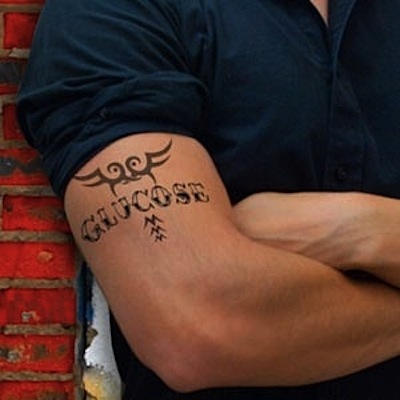 A nanoparticle-based tattoo that can monitor glucose levels in the blood of diabetes patients is under development by researchers at MIT; click the link under the picture to find out more details. From Parent Central via MedGadget.